If you think that you might be a good candidate for Distraction Osteogenesis please contact our office to schedule your first visit with us. Distraction osteogenesis is the process of slowly moving apart (distraction) two bony segments in a manner to facilitate new bone growth to fill in the gap created by the separating bony segments. No. This surgery is always in an outpatient setting. Most patients go home the same day of surgery. The surgical procedure itself is less invasive so there is usually less pain and swelling. Yes. Most insurance companies cover the cost of the osteogenesis surgical procedure. However, it is very important that there is adequate and accurate documentation of the patient’s condition. Of course, individual benefits within the insurance company policy vary. 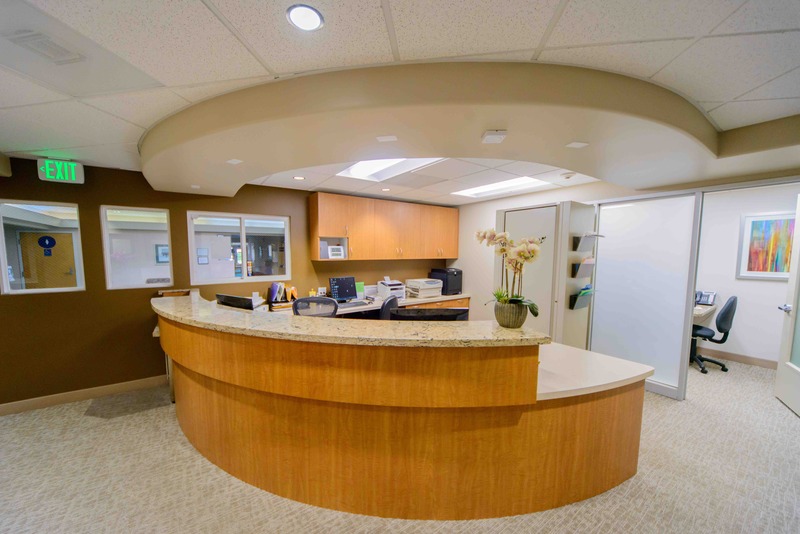 Once we see you for your consultation at our office, we always assist you in determining whether or not your insurance company will cover a particular surgical procedure. During The Surgery – All distraction osteogenesis surgical procedures happen while the patient is under general anesthesia. Therefore, pain during the surgical procedure is never an issue. After The Surgery – After your surgery, we provide you with appropriate pain medication to keep you comfortable. We also provide antibiotics to fight off infection. Activation of the Device – Activation of the distraction device to slowly separate the bones may cause some patients mild discomfort. In general, the slow movement of bony segments produces discomfort roughly analogous to tightening braces. What are the benefits of distraction osteogenesis (DO) vs. traditional surgery for a similar condition? Less Pain – DO surgical procedures typically produce less pain and swelling than the traditional surgical procedure for a similar condition. Single Surgical Site – DO eliminates the need for bone grafts, and therefore, another surgical site. Greater Stability – Lastly, DO tends to have greater stability in major cases that involve a significant movement of bony segments. Multiple Visits – Distraction osteogenesis requires the patient to return to the surgeon’s office frequently during the initial two weeks after surgery. This is necessary because in this time frame the surgeon will need to closely monitor the patient for any infection and teach the patient how to activate the appliance. Additional Surgery – In some cases, a second minor office surgical procedure is necessary to remove the distraction appliance. 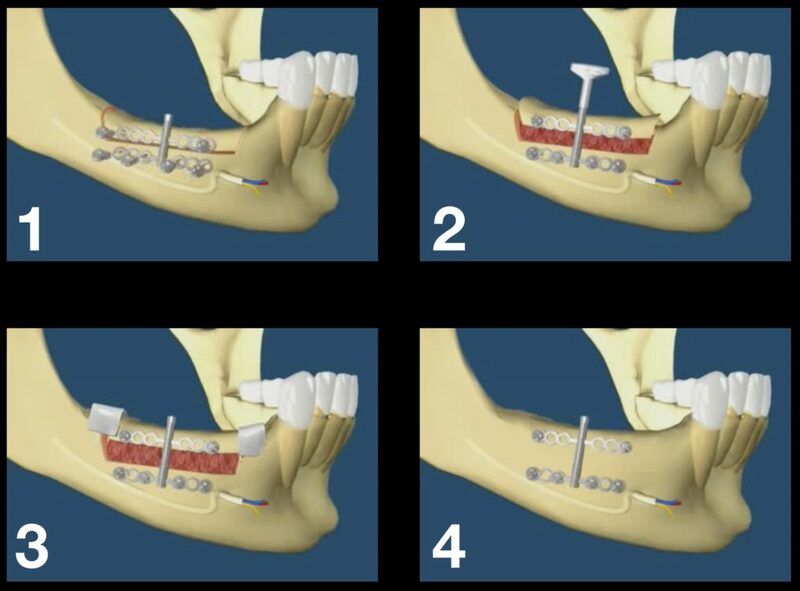 Here is an example of how DO is used to correct a deformity in the jaw to make room for implants. Yes. Because of recent advances in technology oral and maxillofacial surgeons are able to easily place and use a distraction device to slowly grow bone in specific areas of bone loss in the upper and lower jaws. The newly formed bone can then serve as an excellent foundation for dental implants. The procedure of growing bone in the tooth supporting area of the jaw is known as Alveolar Distraction Osteogenesis. No. The entire surgery is performed within the mouth and the distraction devices used by Dr. Chun remain inside the mouth. Because there are no facial surgical incisions during the procedure there are no visible facial scars afterward.